After putting us to sleep with Urban Champion, Nintendo delivers good old fashioned Kirby fun. 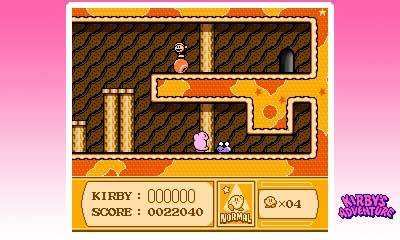 Many Nintendo fans have fond memories playing Kirby's Adventure. The entertaining platformer, released for NES in 1993, brought concepts from Kirby's Dream Land to the console realm, in color, no less. The game's been re-released before, most notably on the Wii's Virtual Console. Now Kirby's Adventure is available on 3DS via the eShop as part of the 3D Classics line, giving users a chance to experience this gem in the third dimension. Does glasses free 3D justify spending $5.99 (we paid $6.99 for some strange reason)? Depends on how big a fan you are. Personally, we think the game looks sweet with the effect turned on. Nintendo did a great job separating objects in the background and foreground. 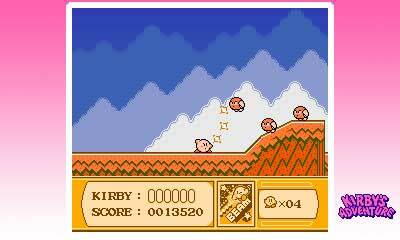 Tops of platforms, the doors Kirby enters, enemies and even clouds seem closer to the screen. It won't blow you away like the visuals in Super Mario 3D Land, but kudos to the developers for implementing a different perspective to such an old game. What's more, the colors are crisp and clean. Bottom line, the original Kirby's Adventure has never looked this sharp. It's essentially an HD version. As for how it plays, you can expect the exact same experience. Kirby wanders through seven worlds, floating through the air, devouring enemies and then spitting them out or swallowing the poor creatures to copy their abilities. This proves useful for completing tougher portions of the game, especially bosses. That said, Kirby's Adventure is quite the pushover. You can blow through the entire game in an afternoon with little resistance from the computer, but the same can be said of many retro Kirby titles. He was a wonderful alternative to the tougher Super Mario Bros. franchise. To that end, we've always praised this game for its catchy music, bubblegum graphics and likeable hero. Nothing here has changed our collective opinion. If anything, this is the definitive Kirby's Adventure. At $6.99, though, it's quite a tough sell. After taxes, it wound up costing a little over $7. Too high, in our opinion. On that note, and if you have the money to spare, Kirby's Adventure still makes a fine addition to your 3DS collection. What's Hot: Foot tapping music, cool 3D effects, fun platforming, consuming bad guys. What's Not: Way too short, expensive, no widescreen option.